I’ve got my blog post scheduled for Friday morning at 12:01am — all ready to go! I can hardly wait to show you how to make my Double Friendship Star with a Twist block, so I hope you’ll be sure to stop by on Friday and check it out. If you leave a comment that day, you’ll be entered to win five 1/2 yard cuts of the gorgeous Dream Basic blender fabrics from Timeless Treasures that I used to make my block, PLUS you can find out where to enter to win a 30 piece fat quarter bundle of each color in the line! My studio smells absolutely heavenly this morning because of one exquisite bloom. 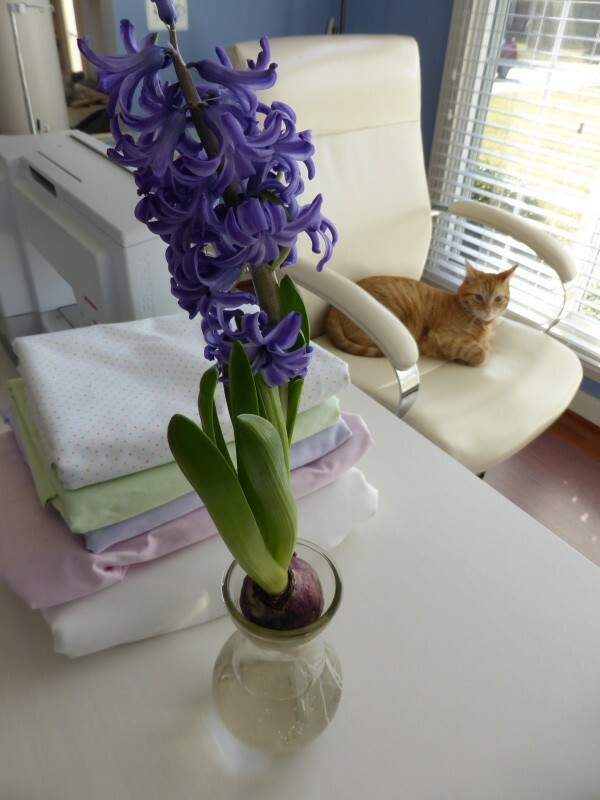 When I was at the grocery store the other day I picked up a hyacinth bulb in a jar for $3.99. It has bloomed and oh my goodness, the fragrance is absolutely wonderful! It is a lovely reminder that spring really isn’t that far away. That fragrance is one of my all-time favorites next to lilacs. 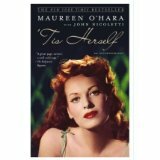 I’m just about to finish a fun, yet interesting-to-read autobiography about Maureen O’Hara. Being a movie buff — especially of the oldies and classics, I have seen many of her movies and always admired her tenaciousness and acting ability. This book certainly shed a lot of light on the behind-the-scenes stories of many of those films! She truly led an interesting a drama-filled life! I hope your week is going well and that you’re finding time to sew, quilt and do the things you love! Good morning, Kimberly, and Happy New Year! First, I would like to thank you for the info about the Blog Tour (I had not heard about it before). I also wanted to agree with you about the lovely smell of hyacinths, but issue a warning as well. Do not touch the bulb as it causes irritation for some people. I have been going through the winter doldrums, and have not gotten motivated yet to get back to my Craftsy class I was taking with you. While working on other projects just before Christmas, I became discouraged because it seems I constantly have to rip out stitches and redo my blocks. I need to think positively about my ability to do this! Maybe my word for 2014 should be Capable, or Dedicated, etc.